NEW YORK — Jahvon Quinerly helped give Jay Wright an early Christmas present on Saturday. After riding the bench for much of his freshman season, Quinerly finally got an opportunity to play significant minutes with Collin Gillespie out with a concussion. Ironically, Quinerly’s arm hit Gillespie’s head during practice on Thursday, causing the concussion. And under the bright lights of Madison Square Garden, the freshman out of Hudson (N.J.) Catholic rewarded his coach. Quinerly played 25 minutes and went for career-highs in points (10), assists (4) and steals (1), helping to guide the Wildcats to an 81-58 beatdown of former Big East rival UConn. He shot 2-of-8 from the field and 1-of-5 from deep. Quinerly’s previous career-high in minutes was 18, and his previous career-high in points was 9. He went through four DNPs and five games where he played fewer than 10 minutes. Dobbs Ferry, N.Y. native Eric Paschall led Villanova (9-4) with 21 points, 6 rebounds and 5 assists, while Phil Booth tallied 18 points, 7 assists and 7 rebounds. Joe Cremo added 11 points. The win snapped a two-game losing streak for the defending national champs. Without Gillespie, Quinerly played 10-plus minutes in the first half, doing some good things and some not so good things. He drew a foul on Alterique Gilbert and made 1-of-2 free throws. He airballed a 3-point attempt. And he made a bad turnover — one of 12 for Villanova in the first half — under the basket. But in the second half, when Villanova used a 19-0 run to take control, Quinerly continued to build on his game. He made a steal at midcourt and fed a cutting Booth for a layup that pushed Villanova’s lead to 43-36. 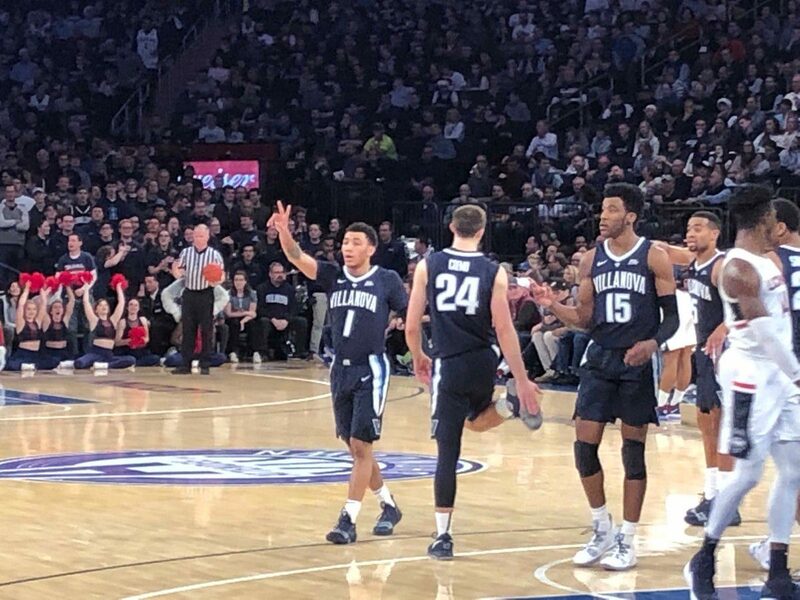 Later he passed up a 3-point look at the top of the arc and dished to Cremo, who drained a 3-pointer from the right wing for a 50-36 Villanova lead. Villanova coach Jay Wright credited Quinerly with playing strong defense on the UConn guards. Defense has been a question mark for Quinerly so far. It has been quite an up-and-down freshman season for Quinerly. He entered with much fanfare due in part to his JellyFam highlights and social media following. 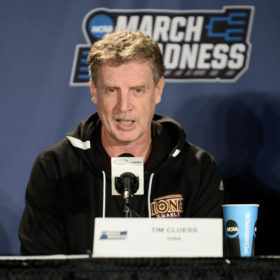 But his frustration over lack of playing time boiled over and on Dec. 13, he issued an apology for the Instagram post he issued following a loss to Penn two days earlier. Quinerly initially committed to Arizona but decommitted after former Arizona assistant Book Richardson was arrested for allegedly bribing Quinerly’s family. Richardson, one of four assistants arrested in September 2017, is due to face trial in April. The post was later deleted from Quinerly’s Instagram. Quinerly said he didn’t seriously consider transferring despite his frustration. Wright said he’s proud of how Quinerly came back from his trials and tribulations. “I’m so happy for him,” Wright said. “This is what college sports is all about. He came in and struggled with our system early. He got down a little bit early, but was in no way negative with the team and made a little mistake on social media.